The Foundation for Free Enterprise Education proudly announces that they have recently expanded their programming to include the Stock Market GameTM, an interactive in-school game for students in grades 4-12 that teaches them about the Stock Market and Securities Industry. For more information on how to support or get involved with SMG, please contact Jeremy Kropf, Technology and Projects Manager at 814-833-9576 x4, or email him at jeremy@pfew.org. If you would like to learn more about the award-winning PFEW program and how you can help, please call the Chamber directly or contact Scott Lee, vice president of marketing & development for the Foundation for Free Enterprise Education at (814) 833-9576 ext. 8, or e-mail him at scott@pfew.org. 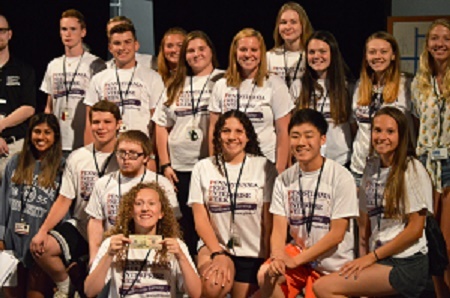 PFEW is open to all current sophomores and juniors in Pennsylvania and information on attendance, as well as program applications, can be found on the PFEW website. Questions can be directed to Amber Goss, Schools Manager for PFEW, by calling her office at (814) 833-9576 ext. 6, or emailing her at amber@pfew.org. Picture Caption: Winners of BizQuiz, PFEW’s version of Jeopardy, celebrate on a busy Wednesday afternoon!